Great for Easter baskets! This week, Target is offering up select movies for only $4.75! 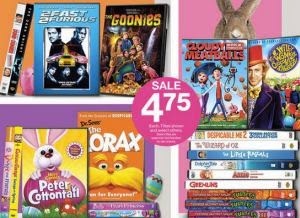 Then add this rare 10% off Movies, Music & Books Cartwheel Offer- making them only $4.27 each! *Note that this offer excludes magazines and The Hobbit: The Battle of the Five Armies Blu-ray & DVD.